Star Wars Battlefront II should’ve been the Chosen One. 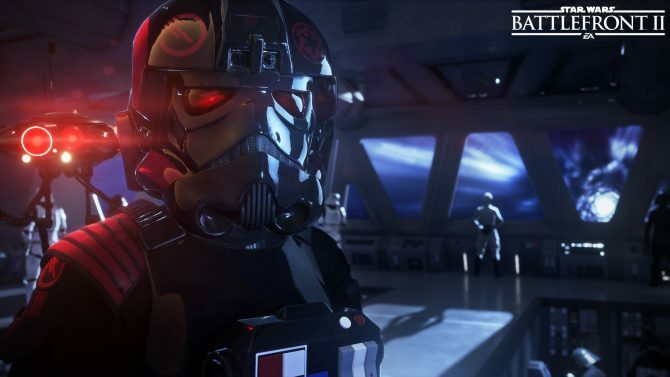 After the lackluster response to 2015’s Battlefront, Battlefront II seemed to have the breadth of content and an added campaign to please that those who felt slighted from the first game wanted in the sequel. At its best moments, Battlefront II is the game that we hoped it would be with some truly breathtaking locales, incredibly fun multiplayer matches, and the best Starfighter gameplay we’ve seen in a Star Wars game since Rogue Squadron. At the core of Star Wars Battlefront II however lie practices that are toying with the Dark Side. 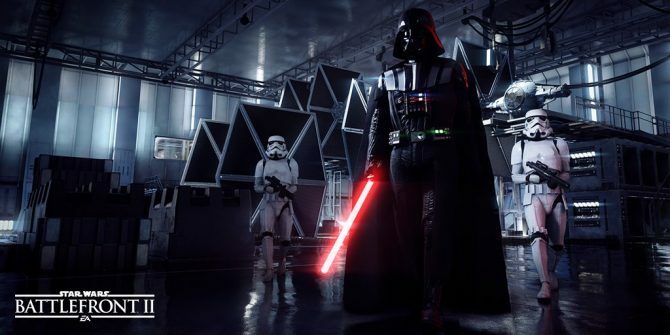 The multiplayer progression system’s reliance on loot crates continues one of the year’s most bothersome industry trends with Battlefront II potentially the worst offender so far. This in addition to a story that doesn’t go anywhere new or intriguing drags the final product down and makes it feel less like a sequel that expands upon the first game, and more like a rushed product that was simply meant to cash-in on the Star Wars license. To best break down Star Wars Battlefront II in its entirety, I’ll be examining each mode from the game separate from one another. Note: Certain story elements are discussed in detail. If you don’t want any elements of the plot to be spoiled, then don’t read any further. Star Wars Battlefront II’s campaign is probably the most disappointing part of the package for myself. As a massive fan of both the films and extended canon in the Star Wars universe, I had high hopes for this campaign considering it would serve as the first Star Wars story told in a video game since 2010’s The Force Unleashed II. Sadly, the plot goes nowhere interesting over the course of its 4-6 hour journey and combines it with boring, repetitive gameplay. What’s perhaps most upsetting about all of this is that the characters within the campaign are well-written and interesting. Iden Versio and the rest of Inferno Squad share some great interactions, not only with one another, but with a variety of well-known Star Wars characters. Walt Williams and Mitch Dyer, the writers of Star Wars Battlefront II, deserve a lot of credit for channeling the often sarcastic, witty dialogue that we’ve come to expect with Star Wars. 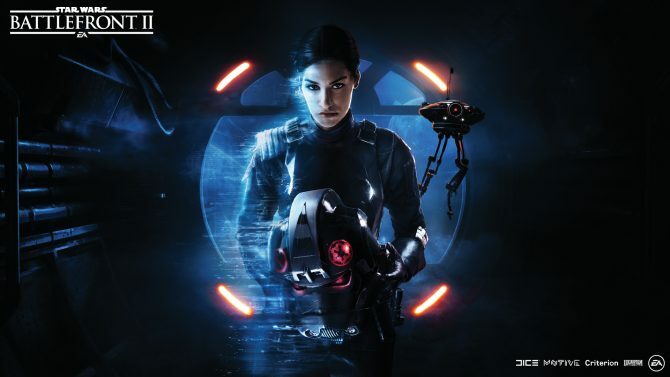 Iden Versio in particular has some really fantastic moments that are further made better thanks to the performance by Janina Gavankar. All of the other performance’s within Battlefront II stand out, but Gavankar’s commitment to the character stands out amongst the crowd. Where Iden’s story starts to fall apart however occurs almost halfway into the campaign. After seeing the lengths that the Empire is willing to go to assert its power in the galaxy after the death of The Emperor, Iden defects and joins the Rebellion — which is the last thing I wanted to see. The entire lead up to Star Wars Battlefront II has centered on the fact that this was supposed a unique story following a character on the “bad” side for once, rather than showcasing another Jedi or prototypical hero. Instead, having Iden Versio defect to the Rebellion left a bad taste in my mouth and made me feel like the promise of exploring a character from an Imperial point of view wasn’t followed through upon. This being said, the reasoning for Iden defecting make sense within the scope of the story, it’s just not the direction I wanted to see things move in. What makes this even more difficult to watch play out is that the entire narrative feels so sped up. Since the story of Star Wars Battlefront II’s campaign takes place over the course of thirty years, we’re often jumping in and out of Iden’s story quickly without having time to stay for awhile and get to know her character a bit more. Iden is an interesting character, but she isn’t one that I feel like I know very well by the campaign’s conclusion. I feel even more lost with some of the side characters who don’t get nearly as much screen time as Iden. Character development is the hardest thing to do when creating any story and I think the timeline in which Battlefront II takes place makes it even more challenging to flesh these particular ones out. As a quick aside, I found the conclusion of the campaign to be rather unsavory because of how apparent it was that they chopped off a handful of remaining missions only to release them as free DLC next month. 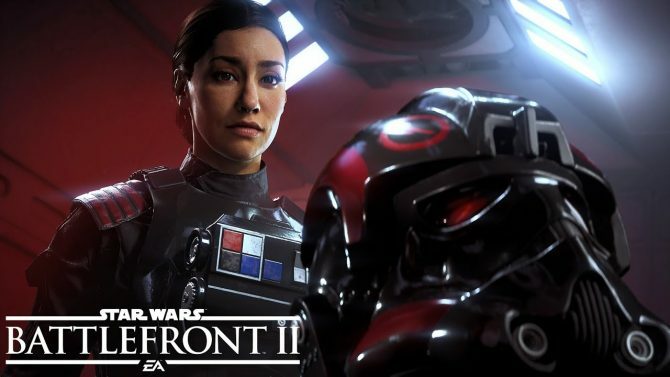 EA and DICE have been beating the drum about how Star Wars Battlefront II will be receiving all of its DLC for free throughout the life of the game, which is a good thing. However, to end the campaign on an awkward note only to release the additional missions three to four weeks later is not free DLC, but instead just content that should have been included with the original package. It’s obvious that this is only being done to coincide with the release of Star Wars: The Last Jedi, but that doesn’t make it any more acceptable. More egregious than the story beats within Star Wars Battlefront II’s campaign is that of its gameplay. In simplest terms, playing it is just boring. Each of the game’s twelve missions sees you either blasting, slashing, or dogfighting your way through mindless waves of Rebel soldiers, Stormtroopers, and X-wings. The combat objectives never do anything more interesting or unique, which is a shame considering there’s endless possibilities in the world of Star Wars. To give you a quick example, one mission within the story has you controlling Luke Skywalker. In this section of the game, you are tasked with fighting back hordes of enemy bugs that you have encountered. After teaming up with a new friend that Luke runs into, you must defend your partner from these bugs that are attacking as he tries to access a pair of computer terminals. The problem though is that this section takes nearly five minutes to complete. So for that time period, you just hack away aimlessly at bugs. Swinging a lightsaber is fun, but not when it’s so uninspired. For all of the beauty that Star Wars Battlefront II boasts, the objectives throughout the campaign don’t get much deeper that the aforementioned situation. I think that lackluster game design has become a larger issue in triple-A games over the past few years, and Battlefront II is one of the most recent examples of such. One of the other primary reason’s why I think the campaign is uninteresting to play is that nothing was done to set apart the mechanics seen in the single player apart from that of the multiplayer. Star Wars Battlefront II‘s campaign essentially feels like an extension of the multiplayer, which is very different than usual. Most other shooters on the market that boast both single player and multiplayer elements usually extend the mechanics that are found within the campaign portion of the game into the PvP. Instead, Battlefront II‘s campaign felt like it was directly pasted from multiplayer. I’ve never really found the Battlefront series, even going back to the original games, to be very interesting in single player. Without the addition of any unique gameplay mechanics, you end up just running and gunning around levels without much thought. While I can understand how this would still please some people, I guess I just expected and wanted more. Rather than harp on its faults, let me first make clear the Star Wars Battlefront II’s multiplayer is so much fun. 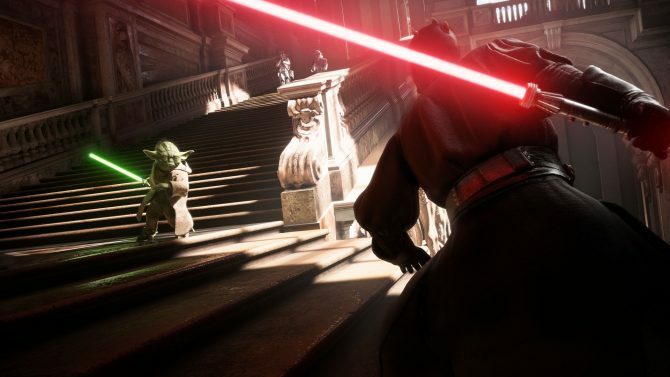 As someone who played the 2015 Battlefront for over 100 hours, the changes that have been made to the core gameplay within multiplayer have led to a far better experience than that of the first game. Creating a class system for all four character archetypes similar to Battlefield is something I found to be greatly beneficial and added more variety to the multiplayer experience. Instead of having to alter both your blaster and Star Card load out like you had to in the previous Battlefront, being able to switch between characters that specialize in specific techniques is far smoother. Even though I don’t love the Star Card system within Star Wars Battlefront II, I do enjoy how much it allows you to customize your play style. For those unaware, Star Cards within Star Wars Battlefront II allow you to add stat bonuses to equipped weapons, give you the option of equipping new items, or grant your character class increased passive stats. Every character, Hero, and vehicle within Battlefront II upgrades through this system and in theory, it works pretty well and gives you the freedom to play how you want. However, this same system is the same that leads Star Wars Battlefront II into some unsettling territory due to the way it is implemented. The primary way that you earn these Star Cards is through opening loot crates. These loot crates can be acquired by purchasing them with in-game currency called credits or through another currency called crystals, which were previously purchasable with real money. As of this writing, EA has removed all microtransactions from Star Wars Battlefront II with the intention of bringing them back at a later date. 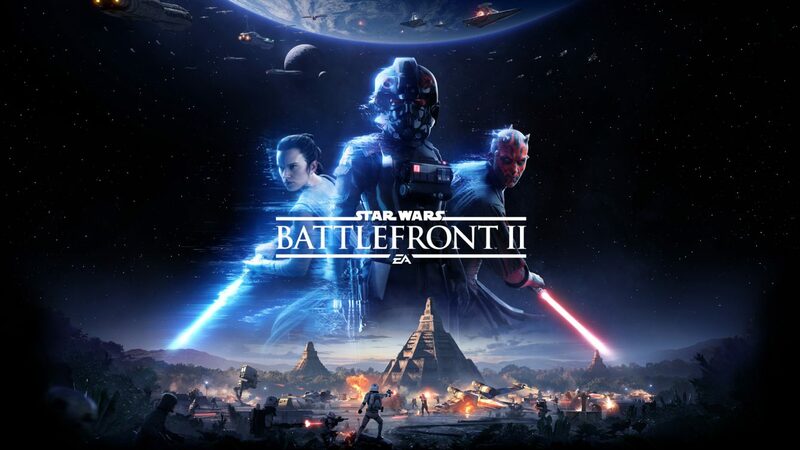 Many claimed that due to the inclusion of these microtransactions, Battlefront II was essentially a play to win title since those who poured money into the game would be able to earn more Star Cards of a higher level. However, a majority of my play time with Battlefront II occurred when these microtransactions were still present yet I always found that those who were of the highest skill always found their way to the top of the leaderboard rather than those who had better Star Cards. However, this claim is a moot point at the moment until we learn how transactions will be reintegrated into Battlefront II. You can see how hard to explain this system is which would be my biggest issue with it. The progression system within Star Wars Battlefront II’s is so bloated, convoluted, and devoid of any logical sense. I have yet to mention that a broad overall level is also within the game, but the benefit for increasing it is nearly purposeless other than gating you when looking to increase the level of your Star Cards with crafting parts. I’m also not a fan of any system that is built entirely around the idea of loot crates. While you can still purchase individual Star Cards in Star Wars Battlefront II with crafting parts, you almost never receive these parts unless you find them in loot crates. In the end, all routes to progression always come back to the loot crates. Having a system built around this random chance element isn’t just disappointing, it’s not rewarding in any way. You have a better shot at winning the roll of Watto’s chance cube than you do of getting at item you’re seeking from a loot crate. It’s hard to ignore the faults of this messy system, but luckily when you’re actually in the middle of a match, you often can’t help but smile. Star Wars Battlefront II’s multiplayer is full of great moments and the variety of the five game types that you can play really help mix things up whenever you get too tired with one kind of match. The main game type that Star Wars Battlefront II pushes to the forefront is Galactic Assault which is a 20 vs. 20 mode. The bombastic scale and sometimes insane objectives that are carried out in these games lead to some crazy situations such as the Rebellion piloting an AT-AT or watching Kylo Ren chop down armies of Clone soldiers. Any time that you save up enough battle points — the in-match currency used to give you access to playing as Heroes and other classes — to play as a Hero character is when you truly find Star Wars Battlefront II shining. The sense of power and speed that you feel in these moments is unmatched and makes you really feel like a Sith Lord, Jedi, or smuggler. One of my personal favorite instances while playing against the Separatists took place on the Wookiee planet of Kashyyyk where I spawned as Yoda and began flipping all around the map chopping droids in half. Similar to when I first saw Attack of the Clones as a kid, I couldn’t help but laugh as I flew around taking out enemies before they even knew I was there. One of the main issues that I do have with Galactic Assault however involves the use of vehicles. In this game type, you can use your battle points to spawn in a starship such as a TIE Fighter or an X-wing, but largely the air-based combat in these matches feels far too separate from the encounters on the ground. Since DICE does also develop the Battlefield games, a franchise where air combat often feels integral to the match, I wanted to see the same in Star Wars Battlefront II. Luckily, the other marquee mode within Star Wars Battlefront II’s multiplayer is that of Starfighter Assault where the space combat is all that matters. 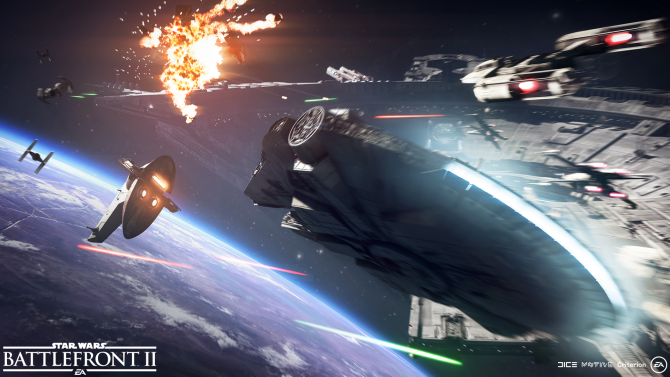 Space battles were one of the most requested features to be seen in Star Wars Battlefront II and the wait was definitely worth it. All of the starfighters control incredibly well and similar to standard battles, getting in a Hero ship like the Millennium Falcon is an absolute joy. While objectives in Starfighter Assault can become a bit too similar, the variety of different locations and battle stations that you face off against helps keep things fresh for awhile. Heroes vs Villains is yet another one of the five game types where as you might expect, it’s purely about the Hero characters squaring off. This game type is a ton of fun, even though it’s often devoid of any sort of strategy compared to something like Galactic Assault. Unfortunately, you don’t have access to all Hero characters from the outset and are forced to purchase certain ones such as Luke Skywalker, Darth Vader, and Iden Versio. There’s been a lot of controversy surrounding this over the past week and while EA and DICE did end up reducing the in-game values of these characters by 75%, I still don’t understand the reason to lock them in the first place. Strike and Blast are the final two game types that round out Battlefront II’s multiplayer offerings and they’re each rather straightforward. Strike is a smaller 8v8 mode where one team is defending a set of objectives while the other team attacks. It’s simple in nature, but I really enjoyed how fast paced these matches were. The smaller size made things feel more intimate and as such I often found that Strike was where the most competition was being had. Blast on the other hand is simply a team deathmatch, which of course has to be included in any multiplayer game. If there’s one large complaint that I do have with the multiplayer in Battlefront II it would be that it’s not doing anything all that original. 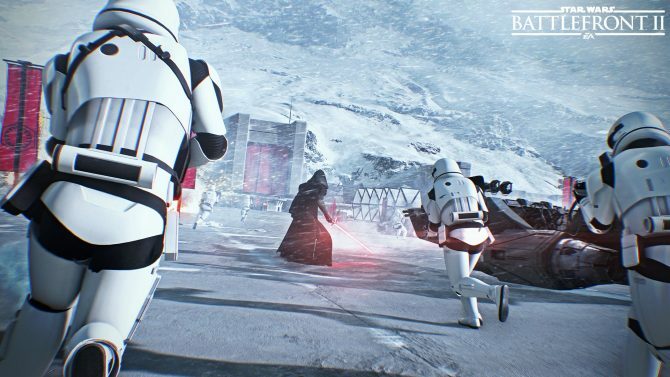 It’s hands down a better experience than what we saw in 2015’s Battlefront, but there’s still a lot of room for improvement and for DICE to carve out what it means to be a Battlefront game in 2017. Arcade is the smallest mode found within Star Wars Battlefront II but it serves as a good palate cleanser between the campaign and multiplayer. This mode allows you to both play against your friends in splitscreen versus matches or play through a variety of short missions called Battle Scenarios. These scenarios typically see you filling the role of one of the Hero characters from the game with the goal of defeating a certain number of enemies in a given time. In total, there are sixteen different scenarios to play with eight each centering around light side and dark side characters. Additionally, each scenario has three levels of difficulty to choose from with a star being awarded upon completion of each one. What’s annoying though is that you’re not allowed to choose the highest level from the outset and you instead must beat the scenario on the lowest two difficulties before reaching the expert tier. I would have greatly appreciated the ability to simply dive right into the harder combat situations from the beginning since the lower two difficulties were mind-numbingly easy. Perhaps the strangest thing about Arcade though is that if you play it too much, you will stop receiving in-game credits as rewards for completing a scenario. To be more clear, you receive 100 credits after every mission you complete. If you complete too many consecutively however, you will be unable to earn any more until a certain period of time later ranging from — what I have seen personally so far — anywhere between 12-14 hours. 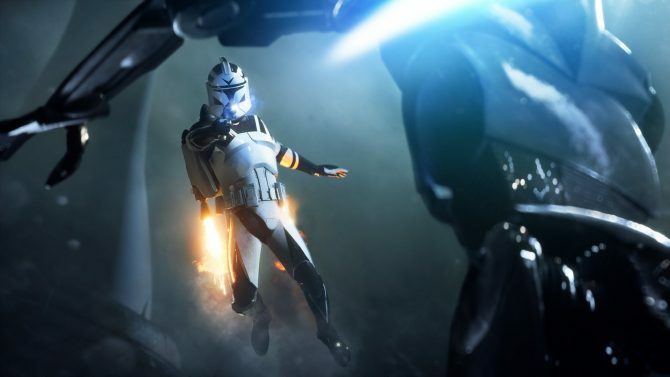 DICE has already spoken about this and claims that the reason for doing so is so that players aren’t able to take advantage of the credits system and earn more loot crates or Star Cards without playing the multiplayer. If that’s the case though, then I don’t understand why they rewarded players with credits in the first place for competing Battle Scenarios. Since DICE seems to only want players to earn more credits by completing challenges or multiplayer matches, then commit to doing it that way. Instead, they’ve just made the credits payout system in Arcade look bad for putting it on a timer similar to what you would see in mobile games. A last thing to mention about Arcade mode is that all of the Battle Scenarios can be done in splitscreen co-op as well. In an age where couch co-op seems to be dying, I appreciate still being able to play with friends in modes like this. Arcade doesn’t win many points for originality, but it can still be fun to jump into every now and then simply to choke out a few Rebel soldiers as Darth Vader. If you want to earn three stars on every Battle Scenario then you might find yourself going back to Arcade quite often, but doing so would be pretty tedious. It’s hard not to feel like Star Wars Battlefront II should’ve been better than what it is. While some like to think that the implementation of loot crates is a worse crime than that of killing younglings, in reality it just proves to be uninteresting and makes it more likely for me to bounce off of the multiplayer sooner rather than later. The real disappointment falls upon that of the campaign which I clearly had too much hope for. It’s not a story that I would say I hate more than sand, but it also isn’t memorable at all. I’ve often theorized that without the Star Wars license, Star Wars Battlefront II wouldn’t make much of a dent in the gaming industry. Of course, it’s impossible to separate the license from the end product, but I truly think that the game’s biggest strength is that it’s simply a Star Wars title. In a time where Star Wars games aren’t being made by the dozen however, Battlefront II at least still knows how to elicit the nostalgic, warm feelings that I have for this universe despite its many problems.